Facebook personality quizzes are all the rage—You can’t go more than a few hours on the site without one of these tests appearing in your feed. I’m serious. Go there right now, and I’ll bet you see at least one that was posted in the last few hours. Minutes, even. Thousands of people take the time to answer questions on subjects covering everything from “What State Should You Live In?” to “Which Game of Thrones Character Are You?” Buzzfeed, a company that’s one of the most prolific creators of social media quizzes, boasts over 130 million users. A recent New Yorker article even christened 2014 “the year of the online quiz.” But why are these tests so popular? If you were asked what the most important thing in the world was when you were eighteen, how would that compare to what you would answer now? Many people say that the teenage years are the period of time when a person finds him/herself. But the truth is that the search for identity is something that lasts a lifetime. Throughout the course of your life, you might have several different career paths, different friends, different ways of viewing the world, or different partners. In the face of a changing world and constantly changing circumstances, a fixed sense of identity can be challenging. As silly as some of the topics of online quizzes are (“What vegetable are you?”), they give us a quick and easy way to define a small piece of who we are. These kind of easy personality tests tell people surprising things about themselves, confirm things about their personalities and values that they want to be true, and identify personality traits and patterns of behavior that they might have suspected were there but have never been able to articulate. One of the great things about social media is the way it connects people from all around the globe. On Facebook, you get a chance to interact with friends and family that you haven’t seen in person in years. When you have a Facebook friend that you know from years ago, what’s the best way to reconnect? How do you catch up and let those casual acquaintances know the kind of person you are today? 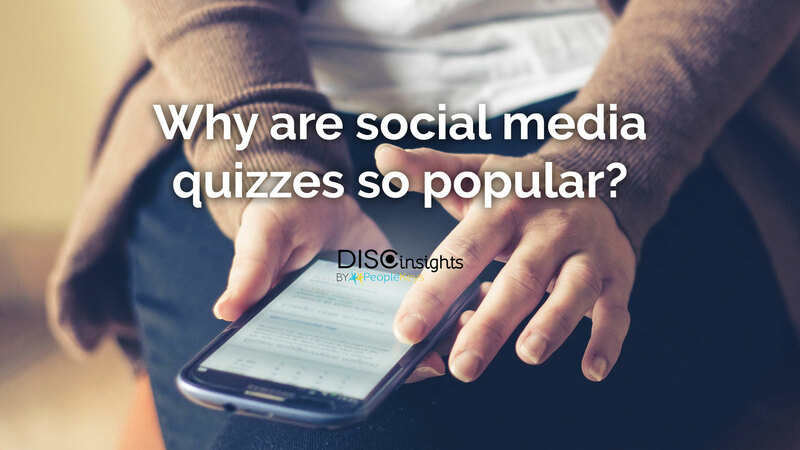 Online quizzes help us find a way to connect with people that don’t know us very well. Even silly and superficial quizzes, when shared, let people know things about our personality that help them feel connected. And sharing those quizzes with other people becomes a way to say "I want to know more about you." 41 million people took Buzzfeed’s “What state should you live in?” quiz on Facebook. That’s a large group of people that all have something in common. If the definition of community is “an interacting population of various kinds of individuals with a common characteristic or interest,” shared social media quizzes could be seen as a way to establish a common connection, a sense of belonging within the group. If you see someone on your timeline sharing a “What Game of Thrones character are you?” quiz, as a fan of the show, you immediately feel connected to the person that posted the quiz, as well as to all of the other people willing to take five minutes out of their day to take the quiz. In the end, it doesn’t matter if you’re a John Snow or a Ned Stark. All that matters is that you found a way to connect with other people in that community, all across the world. The kind of personality tests you see on Facebook are just for fun. And, yes, they do bear a slight resemblance to the kind of personality tests that we use at PeopleKeys. Specifically, most online tests, whether they say so directly or not, use a series of questions that are meant to determine a person’s personality type. For example, let’s imagine you were asked this question on a personality test: Do you like going to the movies or to a party? The answer immediately categorizes you as an introvert or extrovert and shows that your personality style is active or passive. This is very valuable information when it comes to gathering information about personality. Once information like this is gathered, it’s a simple matter of matching the test taker’s type to the right label. What we do at PeopleKeys is based on similar fundamental principles but at a significantly more complex level. The questions on a social media quiz don’t really require any kind of serious self-analysis. And after you get a result on a social media quiz, you’re done—There’s nothing that you need to do with that information other than hit ”share” on your timeline. Personality tests that are administered as part of a corporate workshop or as part of a self-improvement plan have accountability. There’s something you can do with the results—A way to take what you’ve learned about yourself and leverage that information to become happier and more successful. For us, a personality test is just the first step on a long path of self-discovery.